I’m fortunate enough to be friends with one of the team that worked on the development of Dragon Brew, Toby T. Gee. You may recognize Toby from his blog, Roll and Groove, an excellent read that delves into his twin loves of board gaming and music. If you already follow his work, you may have noticed he hasn’t been as active of late (a loss to us all) but I choose to believe it’s because he has been diligently working with the team behind Dragon Brew to bring it to fruition. Toby helped them edit the rules and rulebook and has joined the rest of the team in marketing it to the masses prior to and during its Kickstarter run. It’s because of this welcomed relationship that I was able to play one of the prototypes of Dragon brew, back in May of last year, at Geekway to the West 2016. Dragon brew mixes two of my favorite things, board games and craft brewing. Add in the perfect fantasy setting and you have a recipe for good fun. Apparently in “Brumancia”, the fantasy setting for the game, years of bitter war and conflict have been replaced by a brewing competition. If only our world were so noble. As a worker placement game you choose a fantasy race, each with its own special forms of brewing prowess (perhaps they start with more resources, or more gold, etc.). All the players then proceed through a turn of the game, brewing their special beers that they will eventually put before a panel of judges to win victory points for the place earned at each competition. When I played the game I was informed it was still in development but what I played felt pretty polished, and I had a blast playing. The only thing missing in the equation was a nice cold brew to compliment my gameplay (though, if I recall it was like 8am… I mean, I’ve started earlier… but still). This is August Games’ first product on Kickstarter but they’ve long been ingrained in the board gaming industry as lovers, and promoters, of the hobby. The man at the helm is Daniel G. George who was one of the founders of the Board Games and Brew podcast. Together with Kate Blevins, Jeff Cornelius, and Tom Lathos they’ve been podcasting about board games and beer since the fall of 2014. Daniel came up with the concept for Dragon Brew while chilling on the beach with his wife and a few brews on a rare sojourn from their children (I totally understand this). Reading his Designers Blog (an excellent read for those interested in the process of building a board game), things apparently just clicked in his head. The wort was mashed, all that remained was a little fermentation of the core engine behind the game, and now of course we are at the bottling stage…ok, enough brewing puns, it might leave a bitter taste (ok, not sorry). So let’s get into the pricing for the game, shall we? August Games keeps it simple. There are only three options remaining that get you the game. At $49.00 this is your best bet to get the game at a reduced price. From what I understand the retail price will likely jump to $65.00 post Kickstarter. So basically it’s a good time to buy. As you can see, buying in at the future retail price now will get you some extra goodies. Signed stuff is always cool, plus I dig the art! Getting four copies for $190.00 is a great way for your FLGS to get a head start on shelving the game for future sale. Let them know about it! At this point the game is already 94% funded, and could very well fund before I hit the “post” button. Backers will get this game, especially considering they’ve also partnered with Quartermaster Logistics (the sister company to Cool Stuff Inc.) for backer reward fulfillment and warehousing. Let’s take a gander at a few of the stretch goals that, while not inevitable, are certainly the next step once this funds! Here are the first three. I’m a huge fan of the third Stretch Goal. It’s always a lot of fun when a game can boast it’s own style of Meeple. So like its first two stretches, most of the goals focus on adding a variety of playable races to the game. There are already a lot to choose from but adding more sounds like a ton of fun, and likely something you’ll only be able to get as an expansion to the game later on. Another nod toward the solid move it would be to back during the Kickstarter. What’s in the box you ask? As you can probably tell, I’m geeking out about this game. Get in there quick folks and get a copy. I’d love to see this game shoot through stretch goals! Take care folks! P.S. With only a little more than one hundred tickets to Geekway to the West 2017 remaining, you might be able to corner Toby and I and force Toby to demo this lovely game for you! The 2017 Geekery New Year’s Address! Welcome 2017! Also, welcome back to the Geekery. I’ve been absent for quite some time, I know, but I feel refreshed and ready to bring you all the gaming news, reviews, and tidbits from my day to day gaming you desire. There are plenty of things in the pipe for this year for potential changes to the site, I’ll get to those in a moment. I hope all my fellow gamers, who celebrate the holidays with gift giving, received gifts as cool as what I received. I figured I’d do a little bragging about these right up front, this is my blog and all. This book is an interesting little bird (big thanks to my awesome sis in law for getting it for me!). Obviously it’s more for beginners or collectors of cool D&D books than for the use of a seasoned Dungeon Master, but it has some really cool features on the inside that bring me back to the days when the concepts of D&D were shiny and new. I’ll be giving this book a more thorough run down in a later post but it’s certainly a fun book to own. A great way to introduce new players to the concepts and challenges of a good dungeon delve. Sarah and I love them, and you can never have too many. This year we received two and an expansion to one. Sarah made out huge in the board game arena, Machi Koro is one of her all time favs and as much as we both love Smash Up she typically has the edge on me so our good buddy Jake got her the Pretty Pretty Expansion. We also received Forbidden Island, which if you’ve never tried it it’s a great game for introducing others to the newer generation of games, especially because it’s cooperative. Thanks go to Uncle Grumps for this bad boy. My old mat was tiny, and stained to Hell. We’ve been using a dry erase board for a while now. Awesome to have this now. So my sister in law and my mother in law teamed up here. My mother in law is an enormously talented crafter, who actually has a crafting business now that she has retired. Well, she took some time to make me a bunch of dice bags and then they got me a Big Bag of Dice so I can put together some dice bags to hand out to the kids in my Library games who don’t have dice yet! Giving me the ability to gift to others makes this probably one of the best gifts I received this year. With love and admiration, I give you this journel to keep your adventures, creativity, and words of a world full of wonder! Best wishes on all your journeys beyond our realms. I’m a lucky guy ♥. There’s one gift I’m not going to picture just yet but will at a later date. Suffice it to say it’s my favorite and I hope to premier it at Gen Con 50. May have tipped you off with that last sentence though ;P.
I haven’t spent much time talking about it but I’ve been running a game of Storm King’s Thunder for my group. It’s been a pretty fun experience so far, even if we have been plagued by the inability to truly string together consistent play time (people have lives apparently 😛). Despite our issues getting together we’ve moved along at a decent clip, just now beginning the gargantuan chapter three. It’ll be a challenging portion of the game, for a pre-made, there’s a lot of information for the would-be Dungeon Master to digest and organize for the players but, it’ll also be the most sandbox portion of the adventure and my players will certainly dig that. After all, it took a lot of convincing to get them to take a ride in Zephryos’ Tower (and after they were aboard they mentioned if they’d know about the wizard hat that crowned the thing they would have flat out refused on principle lol). A couple of cool things about this campaign in general is that one of my players, Nick (you may know him as Uncle Grumps from his previous contribution efforts), is running a descendant from a game we played together back in our High School days. In fact the way I got their party to board Zephryos’ flying tower was by having my old character (still alive because..elf) be already aboard and waiting to meet the grandson of Rizzen the Great. Another cool aspect of the game is the return of an old friend to our gaming group who’s been out of state for a long time as he is in the Navy. Somehow he landed a recruitment position here in Missouri and we are all very thankful to have him back with us. I continue to run my once a month game at the local library for teens interested in learning about D&D and I’m happy to say that, despite the fact I still run the game for about 10-15 kids at a time, the legacy players are getting really adept at the game and are very capable of assisting newcomers. There were a number of times in the recent past I couldn’t make it to a session and they had no issue picking up the slack and running a game themselves. I’m now entering my third year of doing this and I’m happy to report that I’m probably not even necessary at this point. Still, I love going and the kids are enjoying my run through of Hoard of the Dragon Queen so I’ll keep at it! Now that I have some extra Dice Bags to hand out I can’t wait to see the kids again. There are so many cool things coming this year that I’ll likely forget a bunch while putting them to print here. I’ll give it a go though. 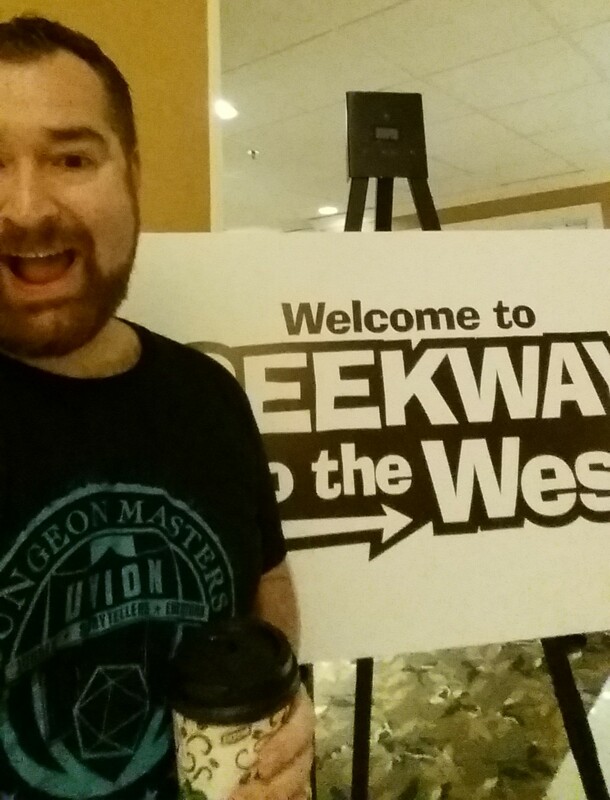 Right off the bat I feel I need to mention Geekway to the West 2017. The 13th Annual Geekway to the West is set for May 18-21, 2017 at the St. Charles Convention Center in St. Charles, Missouri. If you love Board Games I can’t name a better convention to attend. They’ve only got a little over 400 badges remaining though, and considering badges went on sale on January 2nd they will sell out, and fast. For $60 you can attend the con all four days, you receive a random free board game (a quality one at that, twice now the game I received had a Market Price that matched my badge fee), and so much more. Seriously check out the site, make the trip and visit me in Missouri. Gen Con 50 folks. I fully intend to be there this year and, with a little pressure and luck, I might bring a few buddies with me this time (buddies beyond what twitter and the blog have helped me garner that is). Really, Acadecon is one of the best little big cons out there. I truly wish I’d of been able to make it to Acadecon 2016, but I wasn’t going to miss the wedding of a good friend. Two of my best friends are getting married to some awesome gals in the fall of 2017, one wedding is in late October and then the other takes place the week after Acadecon 2017 so chances might be thin I can make it but I’m sure going to try! I love the good folks of the RPG Academy Network and the other attendees of this Con are fantastic as well. Here’s hoping! After years of podcasting, and 300 episodes, the Gamerstable Podcast is ending its run. Back when I first started really getting into the world of folks gabbing about tabletop RPGs on social media it seemed crazy to me that regular folks were coming together and podcasting about this game I love so much. First it was the Monkey in the Cage podcast who really welcomed me into the fold (I will always have a special place in my heart for Matt, Robert, Karen, and Ramses) but soon to follow was a crazy group of gamers who I was surprised to find lived just across the river in Illinois. Matt Fuller introduced me to them, and they didn’t have to give me the time of day. Instead they became close friends. The Gamerstable Podcast has put forth some of the coolest content over its run. Frankly I find their style of taking actual play content and editing it to sound like a radio drama to be the best in the business. That’s beyond the discussion roundtable style they cut their teeth on though, and you can find a ton of great gaming advice throughout their many episodes. Plus, I’ve always enjoyed their bite sized chunks (most eps. are about 30 mins in length). Feel free to catch their last episode here, and when you’re done check the rest of the site. I’d be remiss if I failed to mention that this won’t be the complete disappearance of what I call the “Gamerstable Crew”. Eric Austley, the initiator and leader for Gamerstable, is going to pour more of his energy into his newest project that builds on the success of the Actual Plays put out by Gamerstable. Openly Gamer Theater currently houses a ton of great content and will more than likely feature many of the voices you heard over the years on Gamerstable too! Also, OGT is a yet another proud member of the RPG Academy Network, so you know it’s quality. So I need to pull this article to a close and nothing fits better than detailing a few things about the site! In late 2016 Privateer Press increased its level of involvement with my site for review of their materials and this means I will hopefully have even more Warmachine\Hordes models and products to review going into 2017. To help with this Nick, a.k.a. Uncle Grumps, has made mention of the desire to continue writing pieces on various items associated with WarmaHordes, and hopes to even run something big for our group of players. Also, if you’ve paid attention to the photo gallery on my Warmachine\Hordes page on the site you will have likely seen some of Mike “The Meatfist” Bortz’s excellent work painting his miniatures. Not only will he continue to send me photos of his art but he has promised me a step by step painting guide of one of the newer models to come out for the Trollbloods hordes unit, Madrak, Great Chieftain (Madrak 3). I hope to unveil this soon! Lastly, Topher has been talking about throwing a post or two on here about board games, an excellent candidate for such a thing. I hope he can get around to it (he is getting married this year, me might be somewhat busy). Here’s to some great gaming in 2017! If you feel I missed some news, hit me up in the Comments. What are you excited about this year? …and boy do I have some exciting articles\plans incoming over the next few days, weeks, and months! I know I’ve been gone a while, but I needed the break. I’m a lone writer out here folks and though I endeavor to keep the posts flowing week to week I needed the downtime to recharge. You probably want to hear more about the teased plans mentioned above though right? Well, I can’t spill all the details just yet but I can offer a taste. 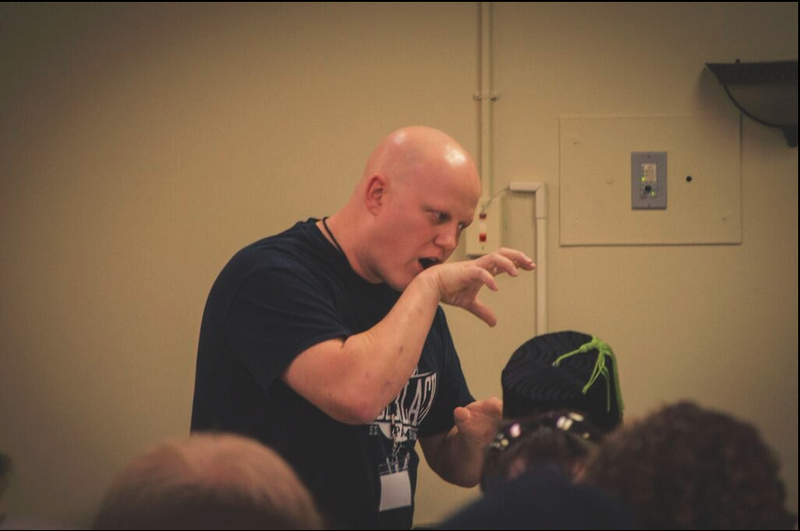 in just TWO days the Kickstarter for AcadeCon 2016 will launch. 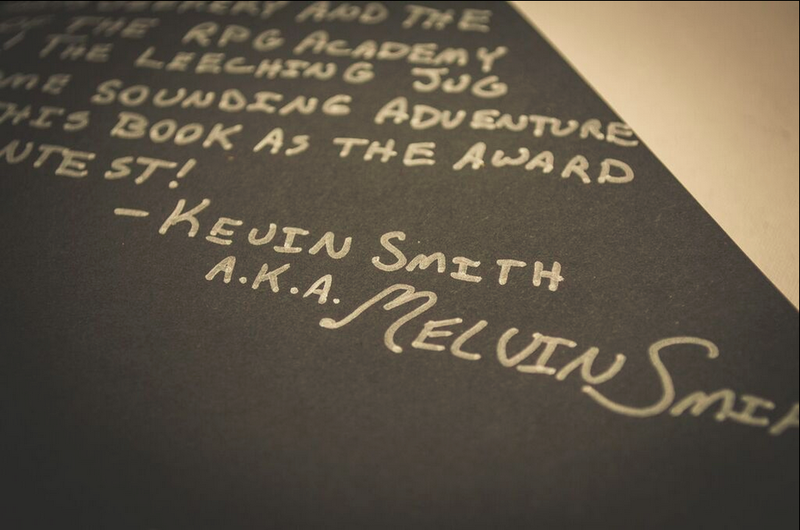 Most of you are aware that I am a proud member of the RPG Academy Network. Due to this I am heavily interested in seeing this convention fund. Though honestly I’m probably less involved in the process than you’d assume due to my membership and I stand to gain less than you likely believe from its funding. When I write my article later this week know that my cheer leading for Michael & Caleb’s little-big convention is coming more from a place of love for the convention and its leadership itself than from anything I actually stand to gain from its funding. I want it to succeed so I have an awesome convention to go to in November, and I want to see you there. As many of you as can make the trip. Let’s sell this thing out folks! I’ll be putting some of my hard earned money toward it even though I don’t have to, I believe in seeing it succeed that much! I have an article to write for Wizards of the Coast. It has taken me a while but I finally finished looking over Curse of Strahd. You may have caught some of my thought’s on Twitter recently but they deserve a full spread. Privateer Press is rolling out a new edition of Warmachine and Hordes. This is huge, the latest edition was released back in 2010 people, it is time for an update. Details are flying around about this new edition and I want to get on top of things and begin to parse down the nitty gritty that you need to know in case you’re interested in how it’ll effect your factions now or, even better, you are just taking notice of this tabletop skirmish game and want to know the best time to get into it (hint: soon). Speaking of WarmaHordes. I’m currently embroiled in an exciting Map Based Campaign titled “The Battle for the Athanc” (basically a high octane version of Risk where actual battles are fought using our WarmaHordes factions). I and my buddy who is running the Campaign have been keeping some battle report type notes and if we actually get our business together I hope to set up a bit of a battlelog for what we’ve done thus far and for how the remaining turns play out. It’s been a blast, even if I’ve had some of the the worst die rolling luck ever throughout. A few fastballs here. I’ll be back at Gencon this year, once more rising with the Gamerstable crew. 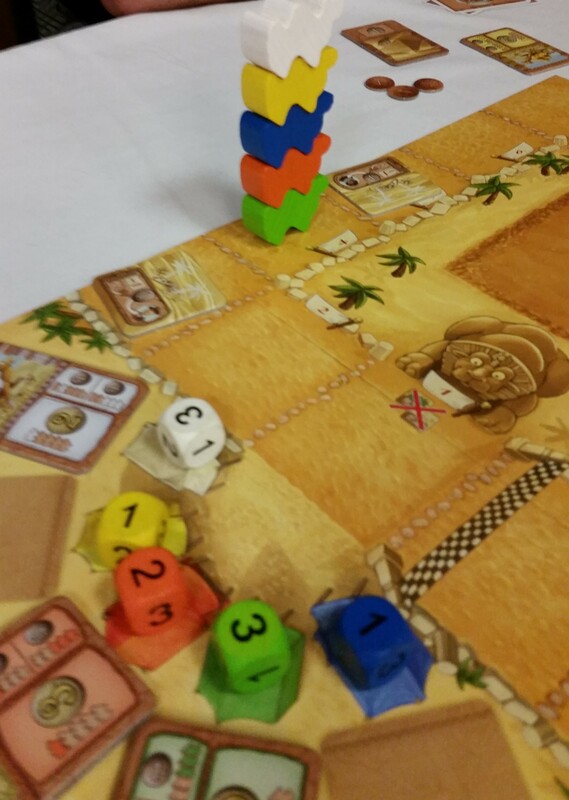 I’ll be rocking some games at Geekway to the West with Toby from Roll and Groove. I hope to get a bit more serious about writing some helpful essays on how volunteering and\or just gaming with the youth in your community can help foster growth in our hobby. I might even sneak in a post about The Division since that game currently has its talons in me. This last one is going to be vague and for that I’m sorry (well…only a little sorry). I have some plans for the site, I want to become a little more polished. The one thing I can say is I want to drop that pesky little “dot wordpress dot com” from the tail end of my web address. Other than that there are just some things I want to work at for making this site a better place to get gaming information, and more frequent information. Hopefully I can fulfill these self-imposed demands, but one good thing about not running a Patreon or some other form of “actually getting paid for any of this” is I am only really beholden to myself eh? 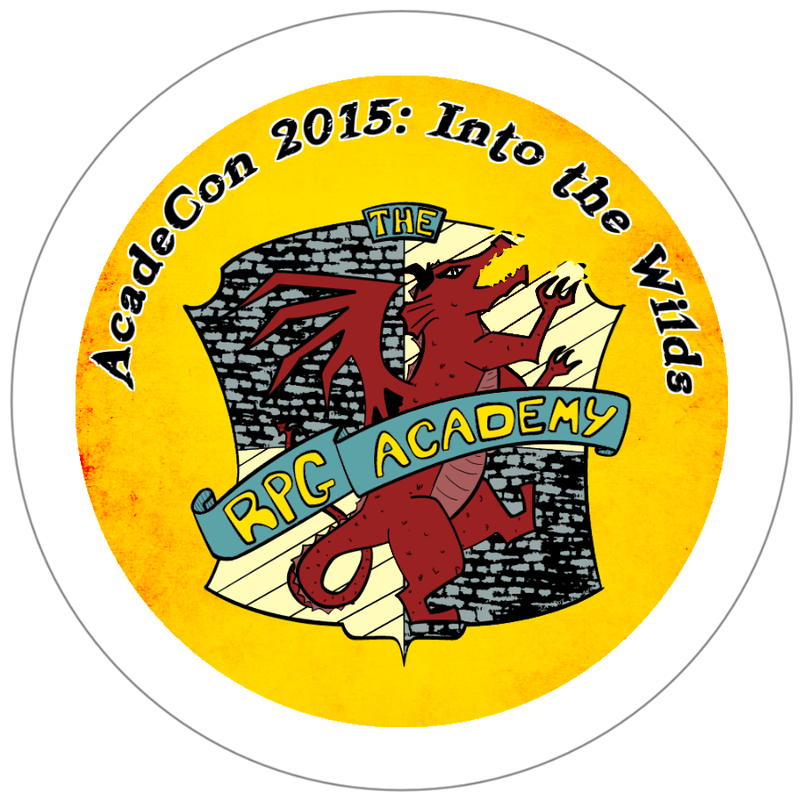 I had been eagerly awaiting AcadeCon 2015 for longer than it had even existed in its current format. Back about a year ago it was slated to be a convention in only name as it was likely going to be held in a basement in Ohio in either Michael or Caleb’s basement, I can’t recall who’s. To think it has now come and gone, and supported a group of roughly 150 badgeholders, faculty and Network members, and VIPs, is frankly staggering. The RPG Academy crowd is beaming, and have all rights to do so. Since the day their Kickstarter funded I had a good feeling about the con (if I’m to be honest I had assumed they’d fund from day one). I wasn’t let down in the least, well worth the nearly six hour drive from Missouri to Ohio. 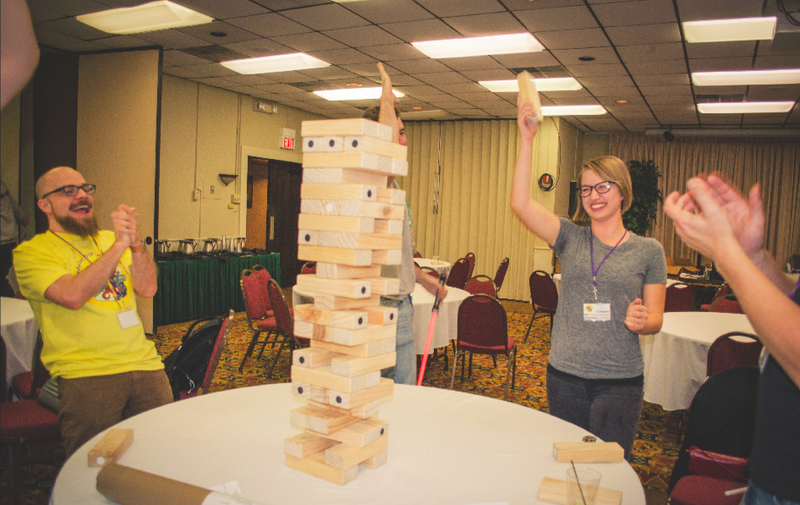 When I arrived late Thursday night I was immediately impressed with the venue, the Hueston Woods Lodge and Conference Center provided a gorgeous, rustic vibe that only added to the feeling that I was “getting away from it all” for some solid gaming. I arrived at the cabin I was sharing with the creators of the con and was thrown headlong into a game of Mysterium right away. 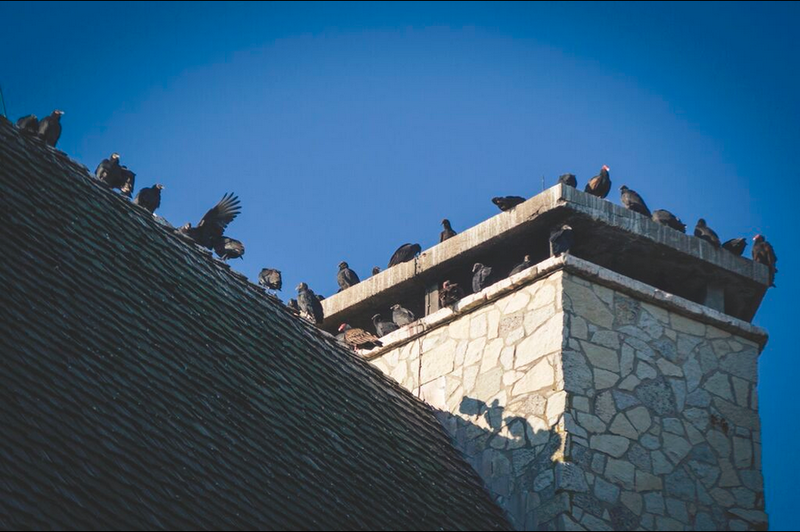 Very rustic… plenty of “well fed” vultures atop roofs! 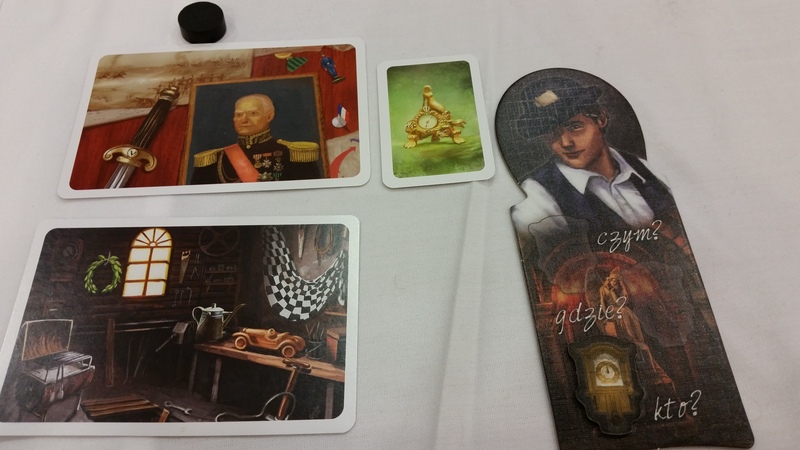 For those who may have missed my recap of Geekway 2015, Mysterium was easily one of my favorite board games. At Geekway I played the Polish version of the game, it hadn’t been ported to the States yet. The game places one player as the ghost of a murder victim attempting to encourage others to solve their murder. Using cards to represent images sent during the player’s dreams the ghost is essentially sending clues as to the place they were murdered, the person and the weapon. The ghost cannot communicate in any other fashion and has to hope the players interpret the image cards correctly. This copy was the Asmodee version of the game, made for english speaking players, and I have to say I was impressed with the little touches they added to the game. Especially adding a shield for the ghost to use that keeps the various places, people, and weapons organized behind it. We won the game solidly, I made for a much better ghost than I have in the past! After Mysterium we played a game of King of Tokyo and chatted until about 2 am and the next thing I knew it was Friday morning, time to start the con! I helped set things up a bit and, after the opening ceremonies, I got ready to run what would end up being my only game GM’ing during the con (despite bringing just about every game I own). I simply had to run it though as it was one of the adventure concepts sent in for my contest back in August. I ended up using Garrett Weinstein’s Savage Worlds Deadlands Reloaded adventure The Lady and the Caskett rather than Aaron Tudyk’s The Leeching Jug for 5th Edition D&D because there were already a ton of 5e games being run this year. I plan to craft a One Sheet for the adventure I crafted using Garrett’s concept of a woman collapsing in a small town, handcuffed to a coffin she’d been dragging through the wilds. The concept remains great and I hope I did it justice! Just you wait for the One Sheet. Running my game, which I think went pretty well, was the only planned activity I had for the rest of the weekend so I was free to pursue games run by others. I ended up running into some friends from Gencon (Dani and John) and was invited into John’s Numenera game for that evening. Highlights include Dani’s animal loving character constantly learning the hard lesson that animals in the world of Numenera don’t love you back, they only hurt you, my Nano evolving into a foodie interested in preparing, and serving, inter-dimensional cuisine, and many other laugh out loud moments. It was the best game of Numenera I’ve ever had occasion to play. John, you ran a damn fine game sah’! To round out Friday night Lucas, one of the creators of City of Brass and fellow member of the RPG Academy Network, and his buddy Aaron, joined me for a game of Arkham Horror. I didn’t have a lot of hope, there were only the three of us, but surprisingly we pulled it off! I believe by the end of the game we had a total of five rumors going and the next turn spelled certain doom. Not sure if I can ever top that game of Arkham Horror to be honest. I called it a night once more at roughly 2 am, knowing I had to be up again in roughly four hours. It was worth it though. I almost skipped Saturday morning’s game, but I’m so glad I didn’t. 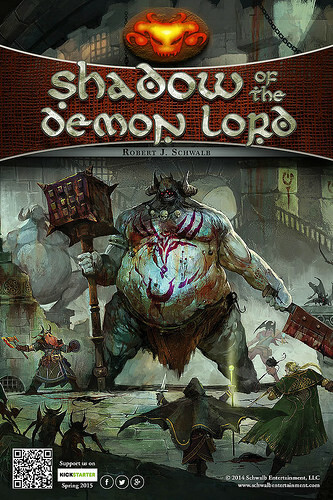 I was fortunate enough to get a seat at Rob Schwalb’s table to play in a game run via his newest Tabletop RPG Shadow of the Demon Lord. The game was raunchy fun, and downright difficult to survive. If you get a chance to play a game of this run by Rob, I say go for it. Great times… though my Goblin PC had to change his pants after the game was over. Middle of the day antics included me joining a game currently in beta testing called Measure of a Badass. The concept is that you play iterations of action heroes, not specific ones but their aspects. This game was loads of fun. Our GM was was Heather Brooks, one of the Co-Creators of the game. I didn’t know it at the time but this was her first experience running the game solo for a group and I’m not certain she was expecting just how much we were willing to run with the concept of being 80’s action heroes. Many times we took the most outrageous approaches to resolving even the smallest of problems our characters faced, simply to add that 80’s action star gleam to things. The best part hands down was how utterly ridiculous our Wheelman flying our helicopter and our Eagle Eye on board with him handled things. They were all over the place, no helicopter should have been able to do the things they made it do. It was great! So sadly I had to work on Monday, and part of me really wanted to get home and go deer hunting the next day so I made the difficult decision to cancel playing in a game run by a new friend Rob Stith, a horror game using a system he was designing. By all accounts it sounded great, but if I’d left at 10 pm I wouldn’t have gotten home until 4 am. I’m adding that to a pile of regrets actually. Biggest regrets, beyond canceling on Rob last minute, would include missing Rohit’s game Sunday morning due to having to leave Saturday night (something I’ll avoid next year hopefully), not taking advantage of the celebrity game designers more, and only gaming with one other RPG Academy Network member (Lucas played in my Deadlands game). Being part of the Network granted me Faculty privileges but other than a few short conversations with the likes of John Wick and Rich Baker, I only really got to meet with Rob Schwalb (no small thing mind you). Even then I didn’t really make huge use of the time for this blog’s purposes. Oh well, I spend Gencon hitting things up for the blog. I was happy to just game at AcadeCon. I was also put out that i once again missed a chance to play a game with the You Too Can Cthulhu gang! I try to get in one of their games every Gencon and fail. Here I had a much better chance and missed it again! One last regret, I swear. I had really wanted to run a game of ODAM (Of Dream And Magic). Ever since they fulfilled their obligations from their successful Kickstarter I’ve really wanted to either play in a game or run one. I thought about it too late to schedule a game and it just didn’t work out to run a pickup game either. I need to rectify my lack of playing and/or running this system. It looks awesome! Bottom line I had a blast, I really enjoyed the rustic setting and even the hordes of vultures perched atop the conference center. The lodge was the only source of food nearby, and they made you pay for it, but having a bar on site was pretty slick. The cell service was awful but free WiFi made that manageable. I made a lot of new friends and feel like I deepened my relationships with my network colleagues and friends of cons past. 100% intend to attend again next year. I hope you join me! I feel like AcadeCon can only grow, it’s got a strong team backing it. Trust me when I say they are already planning 2016. Our network channels are humming! P.S. Thanks especially go to Tressa who not only came through with Ibuprofen to cure an impending migraine but also purchased some metallic markers so I could get the network members to sign the copy of Hoard of the Dragon Queen I still need to send off to Aaron Tudyk! Thanks Tressa!!! P.P.S If I played a game with you and neglected to mention you by name drop me a line in the comments! A little con in St. Louis, Missouri turned 11, and it did so in a big way. Perhaps it’s not even accurate to use “little” anymore as Geekway to the West smashed through all of its own numbers from years past. 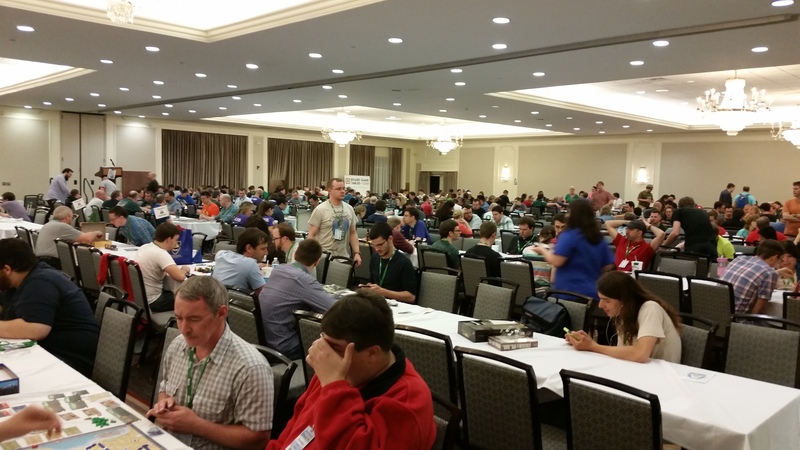 With this gathering Geekway has firmly placed its stamp of existence in the board gaming realm. I can’t think of a past year where I’ve seen more before and after buzz about the con on social media and even in dead tree form. Frankly, the biggest question that has to be on the minds of this con’s crew is whether to continue to grow, or decide on an optimum size. This was my third year at Geekway, and easily my favorite. Not only because they put on their best con yet but this is the first year I actually got to hit it up every day. 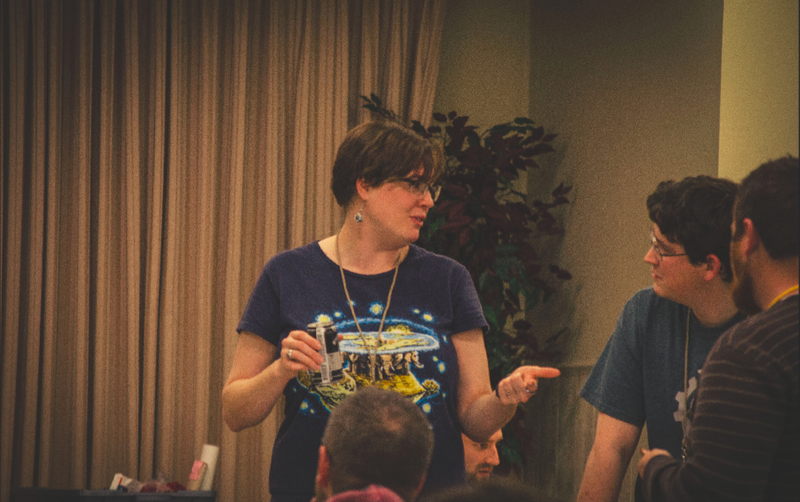 Add to that, the fact that I was finally able to bring my wife Sarah to Geekway and a number of good buddies showed up including Dave Ferguson, creator of The Great Debate, Topher, one of the contributors to this site, and my fellow blogger pal Toby Gee from Roll and Groove. I’ve enjoyed previous years a lot, because I enjoy gaming and have never had issues gaming with strangers, but there is something great about having a group of friends present. Also, it’s always good to have Sarah around in order to humble me. I’ve rarely seen someone pick up on the rules of a game faster than she, and thus she tends to beat me…a lot. I did get her good once though, more on that later! I knew we were in for a good year when I noticed that Geekway sold out months ahead of time. In previous years there was always the option for people to walk up and get a day pass but that wasn’t to be the case this go around. 1300 badges were sold, over 100 badges were handed out to staff, volunteers, and guests, and even a handful of temporary badges were handed out to press and judges. One thing to note too, Geekway hands out a free board game to every paid attendee, well over 1400 games were handed out there alone. For those wondering, these weren’t simply packs of Uno Cards either (apologies to the Uno fans) these were full on Board Games. I received a copy of a game called Skyscrapers that I traded to another attendee for Privateer Press’ High Command. A few other attendee games I saw were Constantinople, King of Tokyo, Locke and Key: The Game, and many more. One needs to consider the fact that the con’s library of games stands at just over 1500, so the 1400 given away at check in would already be an admirable number to bandy about. They don’t stop there however. Geekway holds daily door prizes, where they gave away 75 games, and then there’s the Play and Win games. I’m not certain how long Geekway has had a Play and Win category but I’ve never seen it handled with more finesse or scale than this year’s iteration of the event. In the past the Play and Win slips were placed inside the game box and if you were privy to what games fit the category you, the other players, and anyone who helps teach the game were able to place these signed slips back in the box to potentially be drawn as a winner of the game. 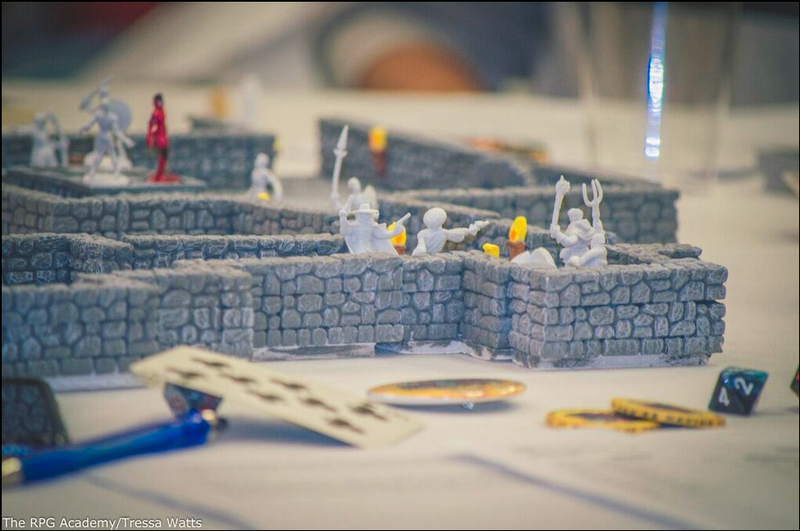 This year the con team set aside an entire room for the Play and Win area, games were placed on tables for ready play and a large bookshelf held copies of the games for people to grab and play within the room or check out if they wished to wander. The slips were placed into already crafted bins labeled clearly on one side of the room. Easily the best set-up I’ve seen thus far and it truly made the Play and Win area the place to be. In fact I don’t think I played a single game that wasn’t designated as a Play and Win, and I played roughly 30+ unique games over those four days! One stand out game grabbed my attention above all others, not to mention the majority of the Geekway attendees for that matter. 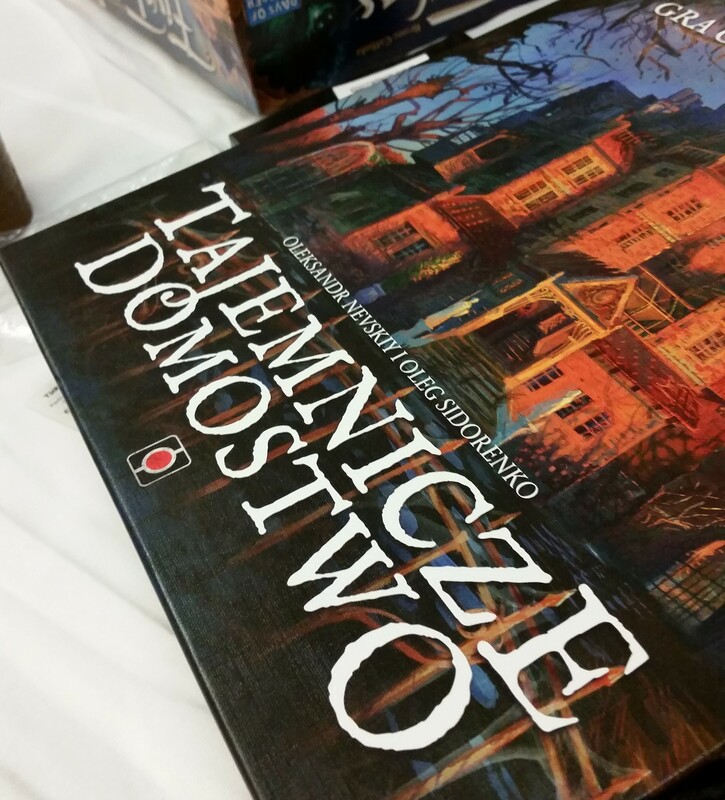 The Polish game Tajemnicze Domostwo (Mysterious Mansion), or Mysterium as it will be named once it’s released in the States, was hands down the Bell of the Ball. This Play and Win was played over 200 times over the four days, easily the most played in the Play and Win category. The game is fantastic. One player takes on the role of a murder victim, now a ghost, communicating with the other players through symbolism within their dreams in order to whittle down a list of suspects, potential places, and murder weapons. If you call it “Better Clue” I wouldn’t argue with you. Take the fact that the gameplay is fun, unique, and co-operative and couple that with the intrigue of a game that isn’t even available in English yet and it’s easy to see the allure. I even got a chance to be the ghost once but, as Dave F. will tell you openly, I did not make for a good one. If you played the game at the con and were lucky enough to have English rules inside the box you can thank me for bringing it to the attention of the con staff by the way *winking face*. I had a number of other stand out games at the con. 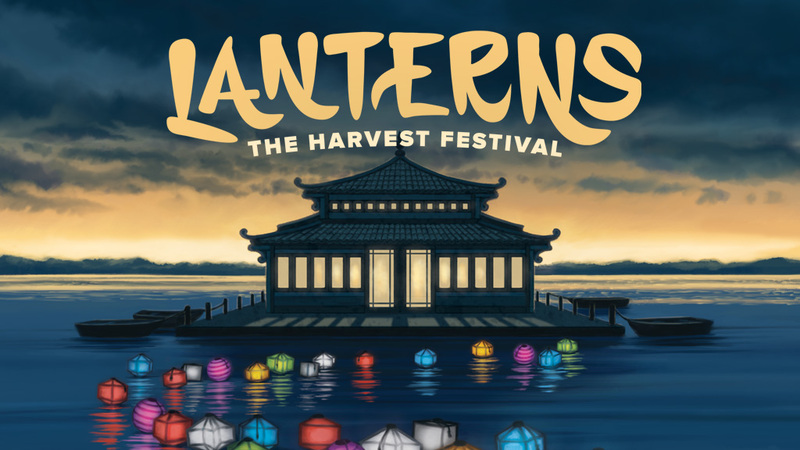 Lanterns was a game where I initially beat Toby, thus giving me the false impression I was actually good at the game, only to be proven wrong by Sarah multiple times. The mechanics are simple, if explained a bit poorly in the rulebook, match colored lanterns to gain them and be careful because every tile you lay down could help a competitor! Scoville was a really cool resource collection game where you plant and harvest different peppers to fuel the ever-expanding pepper market! It was made cooler for me because I just walked in on Friday morning, sat down, and played with two strangers. 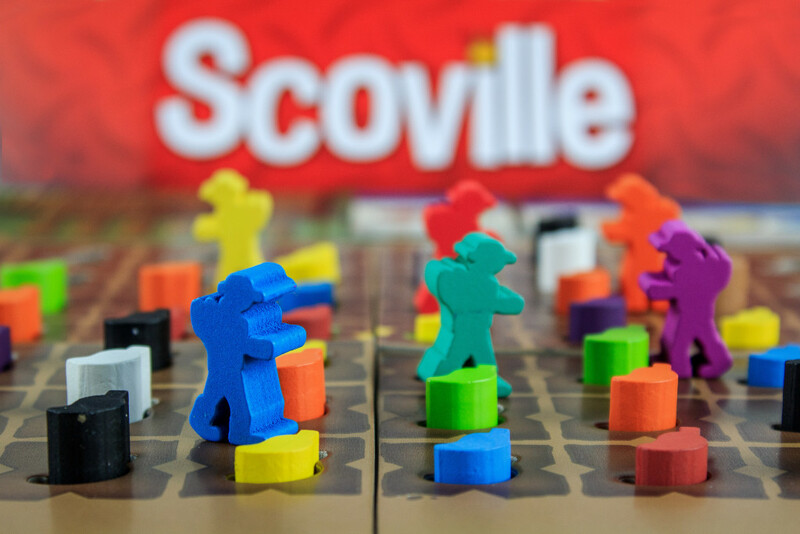 I won that first game of Scoville, we were all three new to it, but the second time around I wasn’t so lucky as, once again, Sarah crushed me on her first time ever playing the game. Look at that Camel stack! Camel Up! was a blast, I didn’t even care that I never won. Betting on those camels was a treat! It has a really fun mechanic where you roll and drop your dice from a pyramid. Attempting to get just one die out of that pyramid did take a bit finesse but it was still fun stuff, the stacking mechanism of the camels and how that changes their place in the race really shook thins up often. Never won a game of it but I did have the pleasure of witnessing Toby’s eldest daughter take us to task with her camel betting skills. My biggest triumph of the Con though came when playing The Worst Game Ever (actual title). The main game-play is simple, roll a die and make a bet that it’ll roll higher than you guessed and then take that many tokens away from whoever you were targeting. As soon as someone loses all their tokens the game ends and the winner is the one with the most (barring the humorous “if there’s a tie” rule). The cards are what shake things up, and it is here that I discovered Sarah’s weakness! You see, every card changes the rules somehow, and many times in humorous ways. Sarah likes consistent rules, she’d tell you this herself. 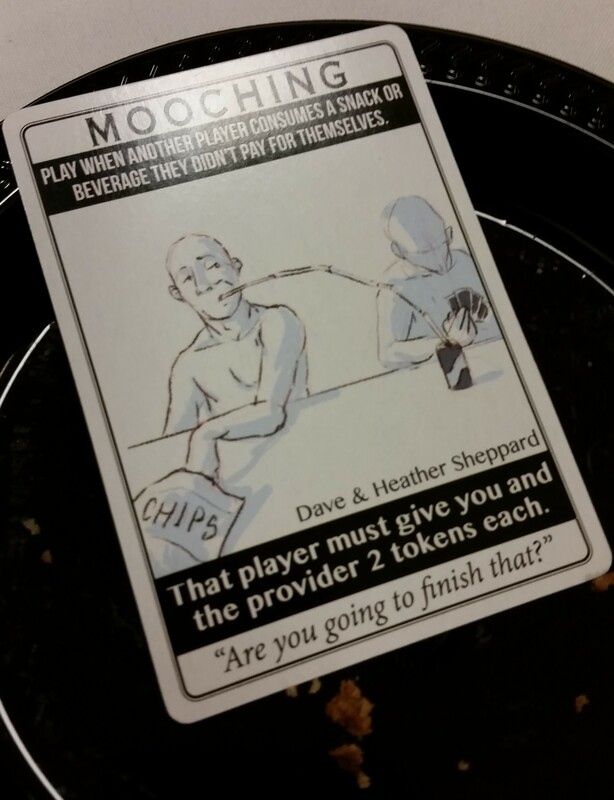 Anyway, I had a card in my hand through most of the game where you play it if someone is caught “mooching’ food or drink from someone else. There was none to be had but I remembered they were selling food in the hall. When I excused myself to use the restroom (honestly fearing there was a card out there that someone could use when i did so) I purchased a cookie on the way back. Long story short, Sarah soon took a bite and I used the mooching card, ending the game. It was fantastic! There were a ton of activities I didn’t get the chance to join in on. Tournaments of local popularity like Crokinole and Battling Tops, or more widespread appeal with Settlers of Catan and King of Tokyo/New York. The latter gaining the victors free passes* to Gen Con (*Edit: The victors won an invitation to the Gen Con World Championships, not passes to Gen Con). There was a game design contest, which my good friend Toby was actually a guest judge for (I’m very envious of that fact but can’t say it wasn’t a well deserved nod to his board gaming cred). I’m sure he’ll be able to elaborate more on the contest in his post over at Roll and Groove. There was even a Guest of Honor I, sadly, never had the chance to meet. The one and only Zev Shlasinger, President of Z-Man Games! 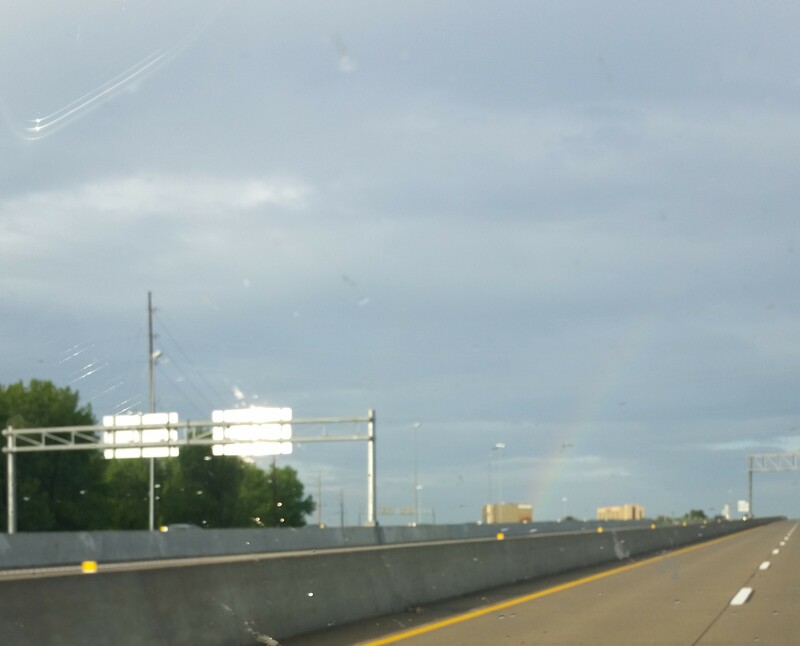 You can barely see it but there was a rainbow over Geekway when my wife and I drove in on Saturday. 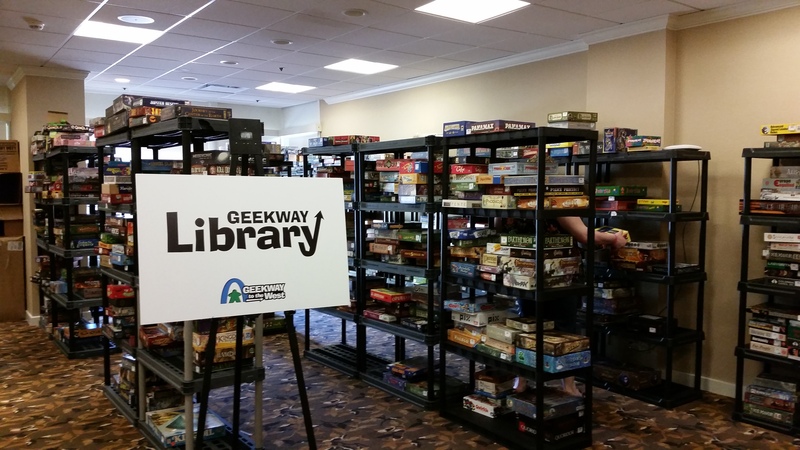 Geekway to the West has some real potential to grow into a mighty con, I’m honestly wondering whether they will choose to do so. Their current venue can’t take much, if any, more, and I’m loathe to see it move because that would likely mean a move away from me, and into the city (St. Louis) to meet expanding space requirements. There is a part of me that wants nothing more than to see it grow to a size of behemoth proportions, just because it damn well deserves to! I only have a few complaints. First, the con takes place right in the prime of graduation ceremonies. I had to miss a good chunk of it last year, and narrowly missed it next year (yes I already checked). Lastly,…I didn’t win a single game from Play and Win or Door Prizes! I mean c’mon!.. Ok, that last one isn’t really fair because I guess I did win a game last year…but still! All joking aside I would suggest you get a jump on your badge next year because there is no telling if they intend to grow the con. It’s a lot of fun as is, and if it continues to garner the growth of popularity I’ve seen thus far and they decide to keep things small, you may start missing your chance to get in earlier and earlier! Take care folks, and keep gaming! Also, just remember… Istanbul was Constantinople.